A. OBJECTIVE OF JAMMING AND WINDOW. E. DEFENSE AGAINST ELECTRONIC JAMMING. Air control demands accurate and continuous radar information. Enemy counternfeasures are one form of action which seeks to deny to us the full measure of radar information which is required for control. The primary objective which an enemy hopes to accomplish when he uses jamming and window is to deprive fleet units of radar information which ordinarily would be available. 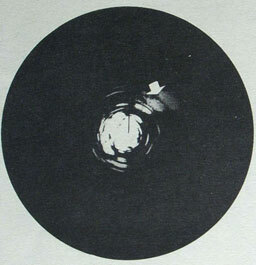 He may "hide" target echoes by electronic jamming, through the use of window, or he may use other decoys to present falsifying or confusing echo patterns. Whatever action the enemy takes, his purpose is the same--to deprive fleet units of radar information. For more definite information on electronic countermeasures, see RADSEVEN, RADELEVEN, and RADTWELVE. Electronic jamming will completely block out whole sectors of the PPI picture and make it impossible to control aircraft in those sectors other than through dead reckoning. The jamming may occur only in a certain sector of the scope representing the direction from which the jamming comes, in which case a patrol placed across the path of the jamming may block an attempt on the part of the enemy to ride down the block-out path of the force. 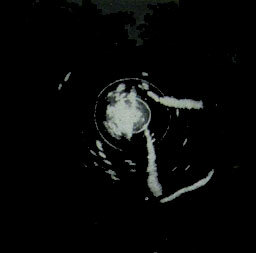 If jamming is strong enough, large sectors of the scope may be jammed so that most of the picture is obscured. As electronic jaming affects the PPI much more strongly than it does the "A" type indicator, control in such a case should be continued from the intercept plotting board. Figure 55. Strong electronic jamming. 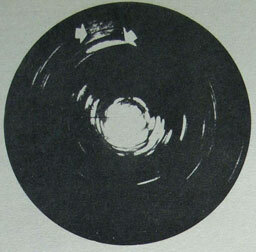 Figure 56.--Getting bearing of jammer. Electronic jamming cannot jam all radars simultaneously, however, and the controller must stand prepared to shift immediately to a radar which is still unaffected. Control may be continued on a jammed radar outside of the "infected" sector if there are targets or planes which are clear of the interference. By means of so called "saturation" raids, window can be used to "hide" a target. This method of deception is relatively simple in its execution and is probably the most effective manner in which window can be used. The procedure for execution consists of one or more planes preceding an attack group en route to a target and each of the preceding planes dropping or "sowing" window throughout an area through which the attack group will proceed. Usually the window-sowing planes will be spread out over a relatively broad front so as to form a wide lane through which the attack group can fly. 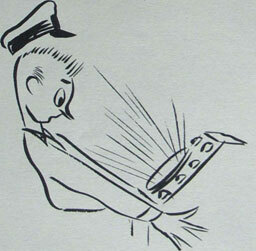 Figure 57.--Jamming as lt actually looks on a PPI scope. Window consists of strips or ropes of metal-ized paper dropped from a plane to simulate air and surface target echoes. This type of deception usually is employed by aircraft at extreme ranges to confuse the control picture. Window will affect radars in widely spaced frequency bands to a greater or less degree. Its strongest effects will be evident on radars whose frequencies are closest to the wavelength of the window. Where the window is spotted rather than sown wholesale, it produces only small areas in which the information is blanketed. Where the window has been sown in sufficient quantities, it effectively blankets the area and renders extremely difficult any degree of accuracy in controlling in that area. 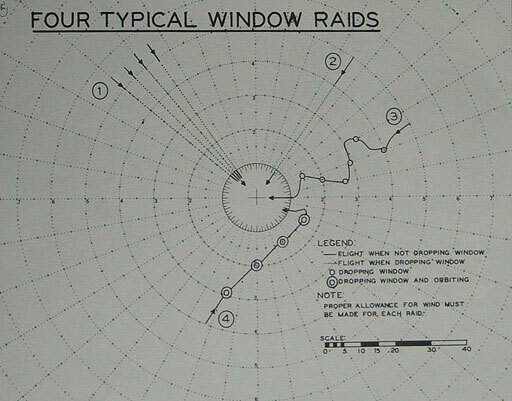 Window may be used to cloak an incoming raid or to divert attention from a raid pressing in from another sector. When window appears on the scope, the controller must be alert to analyze the situation and prepare himself for any type of attack. What was the indicated size of the target before the window appeared? Are there any other indications outside the win-cfcw? 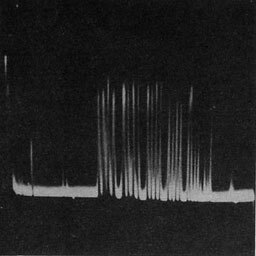 Are there other unidentified blips appearing in any other sector? 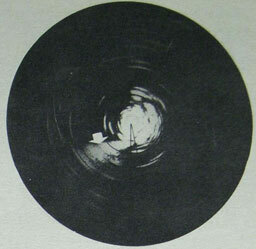 Figure 58.--"WINDOW" on the PPI. If the controller vectors planes to intercept a closing path of window, he can try for the closest blip as the probable source of much of the window, but once his planes enter the window area it becomes extremely difficult to track them by radar. The night controller tries to bring his plane in just astern of the lead blip and try for a contact on the window dropping plane. If only scattered drops are made, the fighter director by avoiding these areas can retain close control of his fighters. As the window begins to fade, it is possible to read a strong return through the lighter mass. Window can only present an echo at the specific range and bearing at which the window is dropped, unlike electronic jamming which interferes with radar reception over the whole range of a radar on a specific bearing. Window is not a radar smoke screen. In order for targets to be "hidden" by window, they must be in the imediate vicinity of the window. Window cannot indefinitely "hide" a target because the window will fall below and out of a radar beam or may be dispersed by the wind. It is most effective about 3 to 5 minutes after it is dropped. From then on the effectiveness decreases because the window strips drop and disperse, causing a less intense echo. Window cannot easily "hide" a target from a radar with a narrow beam and short pulse duration (i.e. SM, SP, or SX). 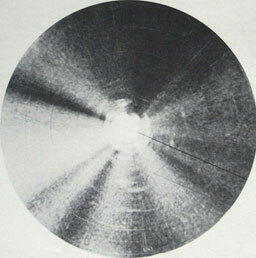 The amount of window necessary to form a cloud with which to "hide" targets is inversely proportional to the beam width and pulse duration of the radar used. It follows that a large amount of window must be used to "hide" a target from radars such as the SM and SP. It is often impractical for an attacking force to carry enough window to do a good job in this case. Even though window can cause echoes on radars over a fairly wide range of frequencies, it cannot be effective against two radars on radically different frequencies. For example, window which is effective against a P-band radar will cause only weak and fuzzy echoes on an S- or X-band radar. Figure 59.--Packages too far apart. 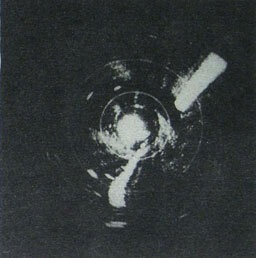 Figure 61.--Long trails of window on PPI. 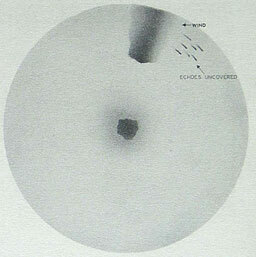 Figure 62.--Dense window clouds on PPI. "WINDOW" on the radar scrceen used deceptively. Figure 63.--Arrows point to "WINDOW" areas. Figure 64.--"WINDOW" areas starting to fade. Figure 65.--"WINDOW" areas starting to fode. 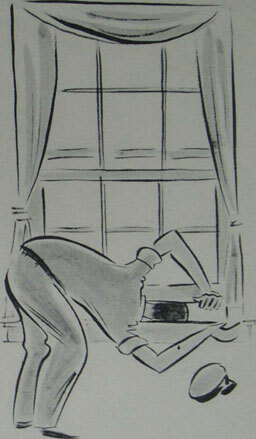 Figure 66.--"WINDOW" has been blown away by wind. 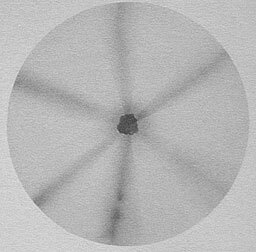 When window is used to simulate target echoes, it has one important limitation. 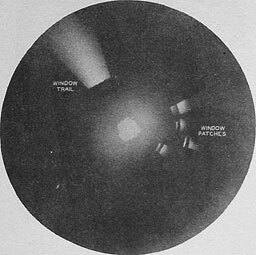 Window cannot accurately simulate a moving target because it lacks motion of its own except as it may be blown by wind. The best defense against a jamming attack is trained and experienced personnel. There are several methods by which CIC officers can combat jamming. If they are thoroughly familiar with available means with which to combat jamming, it may be possible to get good radar information in spite of the jamming. 1. When one radar is jammed, turn on a radar of different frequency. The enemy jammer which jams the one frequency will not jam another; therefore, information can be obtained from the latter radar. 2. Keep in operation the jammed radar. The jammed radar usually is jammed in only one sector. Keep the antenna sweeping always watching for an attack from another bearing. Keep a close watch on the jammed sector as it is usually possible to pick up closing targets as they approach. Also there is a tendency for enemy jammers to drift off frequency, and while the jammer is off frequency information can be obtained. 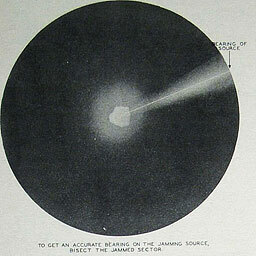 There is the factor that the enemy may not realize he is effectively jamming a radar if it is continued in operation. Don't turn it off. 3. Use IFF to track friendly planes through jamming. By using IFF responses accurate information on friendly planes might be obtained through jamming. 4. Change of gain might assist in tracking through window. 1. Intercept window dropping planes. The window dropping planes themselves are not "hidden" by their own window so interception of them is a routine job. The important reason for intercepting the window dropping planes is that their window may be intended to "hide" other planes. An important tactical maneuver for controllers to remember is to keep their own fighers out of window insofar as possible. Even though they can be tracked through window by using IFF responses, it is difficult to control them accurately. 2. 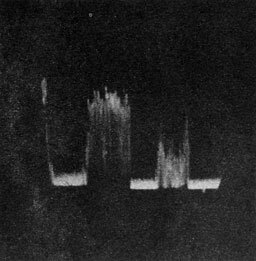 If a target is "hidden" from one radar by a window cloud, train another radar of a radically different frequency on it. The window will probably affect all radars but it will not be equally effective on the different frequency radars. 3. Watch for feints. There are three basic types of feints which an enemy may use with window: (a) Off-bearing: In this case a small group of window dropping planes close and simulate a large attack while the main attack group closes from a different bearing and usually at a low level. (b) On beating at different altitudes: In this case a small group of planes closes at high altitude dropping window, and on the same bearing a large attack group closes at low altitude. The objective of this attack is to cause interception of high level feint groups while the main attack group closes at low altitude unmolested. This type of attack is very effective when only early warning radars are available. It can be countered by using height finding radars with a narrow vertical beam. (c) Rendezvous simulations: In this case a small group of planes or single plane simulate the formation of a large attack group by orbiting and dropping window.